I started out as a research scientist and then drifted into IT. 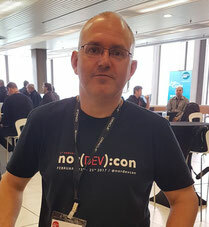 These days I’m an architect in Oracle’s EMEA Technology Cloud Team, have over twenty years experience in the technology industry and a lot less hair. I joined Oracle when they acquired Thor Technology in 2005. I intended to stay for six months and I’m still here. I’m currently focused on helping Oracle’s customers and partners adopt a cloud native approach to development. Outside of work I’m an active member of the Norwich Ruby User Group (NRUG) and Digital East Anglia. I contribute to a number of open source projects and I’m one of the organisers of the DevEast conference in the UK. In this workshop, delegates will implement a saga pattern - a long running transaction across multiple serverless functions running on the Fn platform. Each delegate to bring a laptop with docker installed.